SO....MUCH....FUN!!! Took a group of 15 year old boys here and they had a blast. They were surprised they had so much fun and can't wait to do more. Do you have the winning team? Put your family, friends, and co-workers to the test. 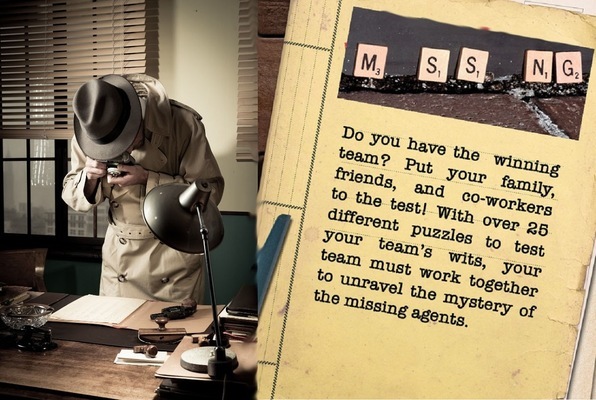 With over 25 different puzzles to test your team’s wits, your team must split into 2 groups to infiltrate “the office” and work together to unravel the mystery of the missing agents before time runs out! Reviews of escape game "Missing Agents"
Definitely a fantastic and challenging puzzle room. Everything, from beginning to end, was incredibly fun and a great bonding experience for our group! Relying on the other half of our group in a separate room to complete our challenges was a unique experience that made completing the room that much more rewarding. Highly recommended!